Renee Hunt is an experienced nutrition writer and recipe developer. She holds a Bachelor of Arts in psychology from the University of Colorado, is certified in optimal nutrition through Texas A&M, and is currently earning a Master of Science in nutrition. She has contributed to Greatist, Way of Gray, and is the founder of Soul-Beet.com. Known to promote brain health by reducing anxiety, improving sleep and providing an overall sense of calm, the neurotransmitter gamma-aminobutyric acid, also known as GABA, acts as a messenger to regulate various functions throughout the body. GABA is the metabolic byproduct of plants and microorganisms. While GABA is not found in fresh food, it can be found in fermented foods, and certain foods can stimulate your body to produce more of it. Fermented foods also commonly contain tyramine, which is contraindicated if you take MAOIs. Before making any changes to your diet, consult with a qualified health care provider. Don't take GABA supplements without the supervision of a health care professional. GABA is not an essential nutrient but has been used therapeutically for anxiety, insomnia, stress and hypertension. Prescription depressant drugs and sleeping medications act on GABA by facilitating its ability to bind to receptor sites in the brain. This produces a calming effect and can induce sleep. Taking a commercial GABA supplement is ineffective for this purpose because it is unable to penetrate the barrier surrounding the brain. This is why more powerful prescription medications are used to stimulate existing GABA in the body. GABA supplements may be effective for treating elevated blood pressure. A study published in a 2009 issue of the Journal of Clinical Biochemistry and Nutrition found that therapeutic doses of GABA helped reduce mild high blood pressure. Low levels of GABA have been associated with insomnia, depression and anxiety; however, to date there are few human studies demonstrating the anti-anxiety benefits of GABA supplementation. GABA is created through the process of fermentation. When lactobacillus fermentation conditions are optimal, GABA production by microorganisms is increased. This makes fermented foods the only dietary source of GABA. Kimchi, a traditional Korean dish, is fermented cabbage that tastes both spicy and sour. 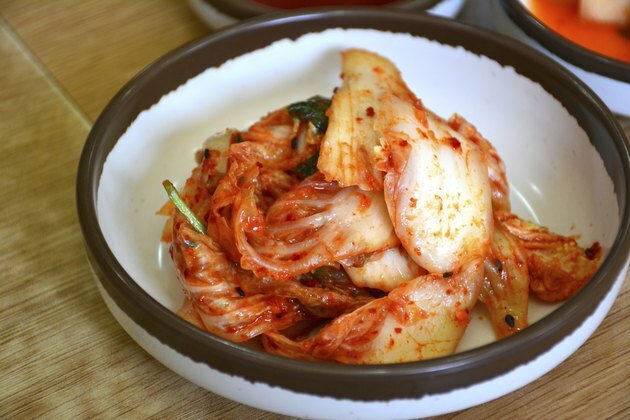 Kimchi that has been fermented with lactobacillus contains GABA and may promote gut health. Other lactobacillus-fermented foods containing GABA include kefir, miso, sauerkraut, tempeh and yogurt. Pu-Erh tea refers to a variety of dark, fermented tea from China's Yunnan province. Proponents of the tea's health benefits claim it contains significant amounts of GABA. A study published in a 2011 issue of the Journal of Biomedical Science by Chien-Wei Hou supports this claim. Hou found Pu-Erh tea leaves to contain large amounts of bioactive GABA. The therapeutic effect of Pu-Erh tea and Pu-Erh tea extracts warrants further study. Until then, you can enjoy Pu-Erh tea in its traditional steeped form. Flavonoids are phytonutrients found in plant-based foods, tea and wine and are known to have powerful antioxidant, anti-cancer and heart-protective properties. Flavonoids may also enhance GABA function. A study published in 2011 in the British Journal of Pharmacology illustrates the impact flavonoids have on specific GABA receptors in the brain. This study demonstrates the need for further study and outlines potential benefits of synthetic flavonoid development to treat brain dysfunction. Foods containing flavonoids that may influence GABA function include berries, citrus fruits, apples, pears, tea, cocoa and wine. Medicinal plants include chamomile flowers, feverfew, linden flowers and passionflower.